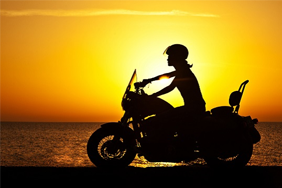 It’s important to take careful consideration when securing your motorcycle and storing it overnight. 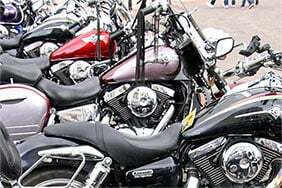 Thieves often steal motorcycles to order, to be broken down for parts or for a joyride. They’re relatively easy to steal too, as they don’t need to be broken into and can be lifted then transported elsewhere. So it’s a good idea to consider effective forms of security when you buy a bike. It’s also worth looking at finding a safe place to store your bike while it’s not in use. 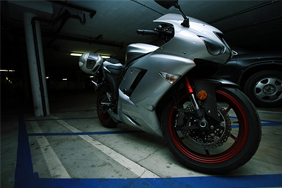 Ideal storage for your motorcycle is a locked garage as the bike’s hidden from thieves and secured. Some may argue that any garage - locked or unlocked - will provide some security for your bike. However, an unlocked garage means easy access. This could also work in a criminal’s favour by providing cover for them to work unseen. If you haven’t got a garage, it might be useful to consider a motorbike storage unit. Although costly, these small bike sheds can be anchored down and installed away from the road. Always make your insurer aware of this before you make the investment though, as they may not class it as a ‘garage’. Generally it’s a good idea to park your bike away from the road, even if you have a residential parking permit. A better option again is a driveway or secured car park. This will reduce the risk of the bike being hit by other vehicles. Better security means less risk of theft or damage, and less risk tends to mean lower insurance premiums. 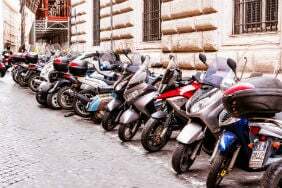 Keeping your motorbike in a secure car park could be looked on favourably by insurance companies. Often, if the car park’s secure, it’s monitored by CCTV and may have gate- or pass-operated barriers. Car parks that allow access to the general public are generally less secure. You should make the type of car park you use clear to your insurer, as it could affect your premiums. Ground anchors are fitted to the floor or wall. The bike can then be attached to the anchor by a chain or lock. They’re relatively easy to fit, and contain comprehensive fitting instructions. Most ground anchors can be installed yourself. 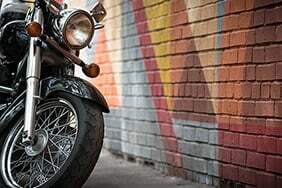 When using a motorcycle security chain, be sure to secure the frame of the bike not just the wheel. Attaching the chain to the wheel leaves the rest of the frame vulnerable to theft. Padlocks, D-locks and disc locks can also be an excellent way to deter thieves. Bikes secured with chains and other locks should be attached - where possible - to dedicated motorbike and cycle stands. If this isn’t possible, ‘street furniture’ like lampposts can be used. However, you should always check that you’re authorised to do this. Using items like angle grinders and bolt cutters, thieves can easily cut through chains and locks. So it’s worth looking into additional security measures for peace of mind. Before you buy your locks or chains, you should check for a Sold Secure logo. Using a bronze, silver and gold rating, Sold Secure tests the security of these products against tools commonly used by thieves. In addition, insurers and the police work closely with Sold Secure to ensure that it’s keeping up with modern methods of theft. As a backup to your exterior security measures, it’s worth looking into the more subtle methods of protecting your bike. Trackers use GPS to track the location of your bike. These alert you if a potential theft has occurred, as well as the relevant authorities. Using Alpha Dots to mark your motorcycle is an effective security measure. The ‘dots’ contain a unique pin that’s registered to you. The dots come in a glue-filled applicator which can be applied to different areas of the bike. If it’s found on stolen property, the owner can be identified easily as the police can access the registration database 24/7. 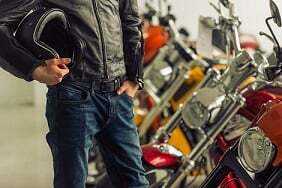 Some insurers may offer a discount for bikers that use these kinds of security tech. 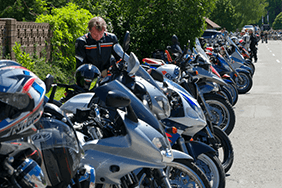 Immobilisers ensure that the bike can’t be started unless the proper key is used. Unfortunately, bikes don’t come with this technology fitted, but they can be easily installed by a professional. Some immobilisers come with a combined alarm, which is much more effective than the alarm alone. 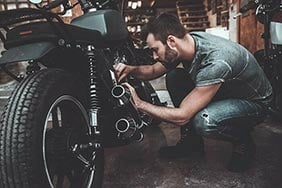 If an insurer offers you a discount because of additional security on your bike, make sure you have proof. If you need to make a claim and there’s no record of this security, the insurer could void your policy.